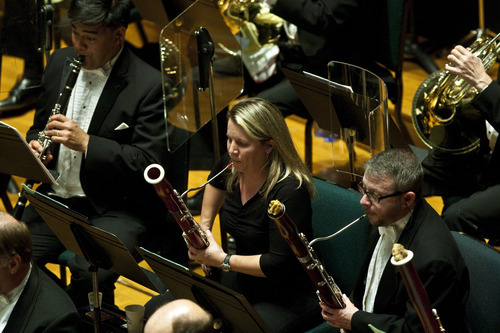 Lori Wike • The Utah Symphony bassoonist was a finalist in international contest. 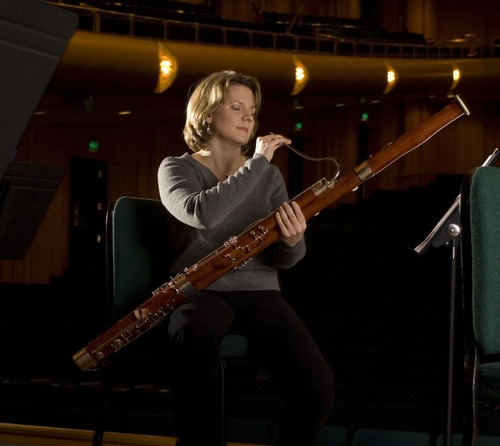 Utah Symphony principal bassoonist Lori Wike has a less-well-known talent: She&apos;s one of the world&apos;s leading palindromists. Wike was one of 10 finalists in the Short Palindromes category of the first international SymmyS Awards, presented in Portland, Ore., on national Palindrome Day  3/10/2013. Her nominated palindrome was titled "Facebook Photo": "Hag&apos;s mug on net: torrid, a nadir, rotten, no gums, gah!" "Facebook Photo" didn&apos;t win an award from the judging panel, which included New York Times crossword-puzzle editor Will Shortz, musical parodist "Weird Al" Yankovic and They Might Be Giants member John Flansburgh. But it earned praise from contest organizer Mark Saltveit, editor of The Palindromist Magazine and a world-champion palindromist himself. "I wish it had done better," Saltveit said by phone from Portland. He praised Wike&apos;s concise focus and colorful use of language. "I also loved that &apos;gah!&apos; at the end. It just gave it a little kick." Jon Agee won the Short Palindromes category with his "Igloo Dialogue": "An igloo costs a lot, Ed! Amen. One made to last! So cool, Gina!" Wike said she&apos;s always loved brain teasers, word games and logic puzzles. She started writing palindromes about a year ago, sending them back and forth in a friendly competition with her fellow Utah Symphony double-reed principal, oboist Robert Stephenson, and was delighted to discover a magazine devoted to the art form existed. Is there a trick to writing palindromes? "I&apos;ll notice a word that, backward, seems to have palindrome potential," Wike said. "The trick is to make them have as much sense and syntax as possible. That&apos;s very tricky with the longer ones." Saltveit said it was a conversation with Shortz that sparked the idea for the SymmyS. "He&apos;s a guy who loves competition." Shortz was host of the World Palindrome Championship last year in Brooklyn  "basically the &apos;Iron Chef&apos; of palindromes," Saltveit said, explaining that the contestants had to compose palindromes with certain constraints (his winning entry used the letters X and Z) within a time limit. But the puzzle maven wasn&apos;t interested in making the event annual, so Saltveit picked up the baton. "Some people are not so good under pressure," he noted. "I thought it would be better to model [the SymmyS] on the Oscars." The competition received about 250 submissions in four categories: Short Palindromes, Long Palindromes, Poetry and Word-Unit Palindromes. The surging popularity of that last category  in which entire words, not individual letters, read the same backward and forward  surprised Saltveit. "That became the big thing of the competition spontaneously," he said. "It&apos;s easier for a first-timer to get into." "No narc in a prison? No sir, panic ran on." Musician&apos;s Dilemma: Practice or Party: "I&apos;d revel. Ban mad, damnable Verdi!" Perfidious Composer: "Did Rossini stray? Art sin is sordid." Nurse&apos;s Complaint: "Emetic delivery reviled. Cite me!" "Dame killed. O, yodel like mad!" Oedipus Outraged: "Dammit! Olden ma desire? Kill a rival? (unnatural lit!) A Rex era, till a rut. … Annul a viral-like rise? Damned lot! I&apos;m mad." Email About Popemobile: "E-note: Got Pope tote? Pop to get one." "Notice to Public: Exercise taxing respiration? Consuming energy bars? Legislator bars energy-consuming, respiration-taxing exercise. Public to notice." To read the winning entries in the first international SymmyS, visit http://www.palindromist.org/symmys.